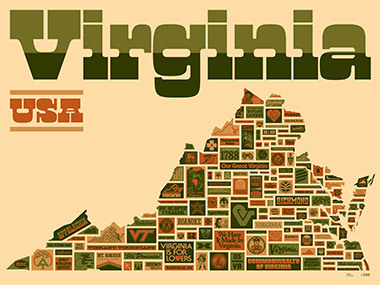 I don’t know why we’ve held out this long to make a Virginia “Things We Love” poster? Logo gigs in/logo gigs out? Our hectic road schedule? Everythingelseness? It’s kind of hard to say, but know this: We weren’t cool with it. And then a couple years ago on the book tour, when we spoke in Richmond and Virginia Beach and didn’t have the poster for the merch table? Not good. Felt horrible. This time around, traveling back to Richmond, I wasn’t got to let ol’ Virginny down. Sorry about the wait! Go, Virginia, Go! 02. Four colors! Inspired by Appalachia mountain drives in the fall, in and out of Virginia. 04. Proudly printed by our Sic Semper Tyrannis buddies at Seizure Palace! 05. Get in there: Click here to zoom in to see this one up close! 06. Works all over Virginia. And beyond. From Virginia Beach, up the coast to Jamestown, and up to Arlington, then down to Charlottesville and marching into Richmond, then due west to Blacksburg. This poster will not let you down. 07. Dedicated to Puck Byrne and Cabell Harris in Richmond! ©2019 DDC Dry Goods Div., Merch Dept., Portland, Ore.